New Zealand's Marti Friedlander is surely one of the world's great documentary and portrait photographers (of any era), but is not a household name outside her adopted homeland. The photo opposite is typical of her three-dimensional eye, which characteristically juxtaposes foreground and background subject matter, with acid wit and insight. She may not have been a Magnum photographer, but she is as accomplished as any in all of the great photo agencies of the world. Sarah Daniell interviewed her for The New Zealand Herald. Marti Friedlander was born in 1928 to Russian Jewish parents. She was raised in an orphanage, with her sister, from the age of 3. 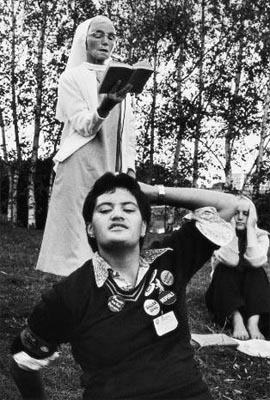 Marti emigrated to New Zealand from Britain in 1958 and began taking photographs of people, places and protests. Friedlander is 84 and lives in Auckland with her husband, Gerrard. 1. What compelled you to pick up a camera and start taking pictures of faces that weren't famous?